kale pesto… am i serious? yes, i am! even though it was difficult to imagine, i tried it out and i can tell you, it tastes fantastic! at the time when i discovered the recipe and the wonderful pictures of the kale pesto on farmhousedelivery.com i was so happy that there will be a use for our “bonsai”kale and we do not have to through it away, because the amount is too small to cook anything with it. but to prepare this kale pesto, even the poorest harvest is rich enough. and by the way, it is the most seasonal, regional and fresh way to appreciate the mediterranean taste of a pesto, even during winter. i adapted the original recipe to my needs and my indication of quantity, but you should not miss to check out at least the great pictures on farmhousedelivery.com, i am really fallen in love with. wash the kale leaves and blanch in cooking water for not more than one minute. remove and rinse with very cold water to stop the cooking process and to preserve the nice green color. drain and absorbe as much water as possible with kitchen paper. now you can place the kale, pine nuts, garlic and as much olive oil you will need to bind the sauce into a kitchen machine and combine until it gets a smooth consistency. add the parmesan, more olive oil, if necessary, and season to taste. cook your pasta al dente, rinse in a colander and preserve a little bit of the cooking liquid. combine pasta, pesto and cooking liquid and enjoy the amazing taste! grünkohl waschen und in einem großen topf mit kochendem salzwasser nicht länger als eine minute blanchieren. abgießen und mit sehr kaltem wasser abschrecken, um die schöne grüne farbe zu bewahren. abtropfen und so viel kochflüssigkeit wie möglich ausdrücken. blanchierten grünkohl grob hacken und mit den gerösteten pinienkernen, knoblauch und einem guten schluck olivenöl im mixer pürieren. den parmesan hinzugeben und falls nötig etwas mehr olivenöl. mit salz und pfeffer abschrecken. die pasta al dente kochen. etwas kochflüssigkeit aufbewahren. pasta, pesto und einen schluck kochflüssigkeit mischen und servieren. guten appétit und genießt diesen großartigen geschmack! 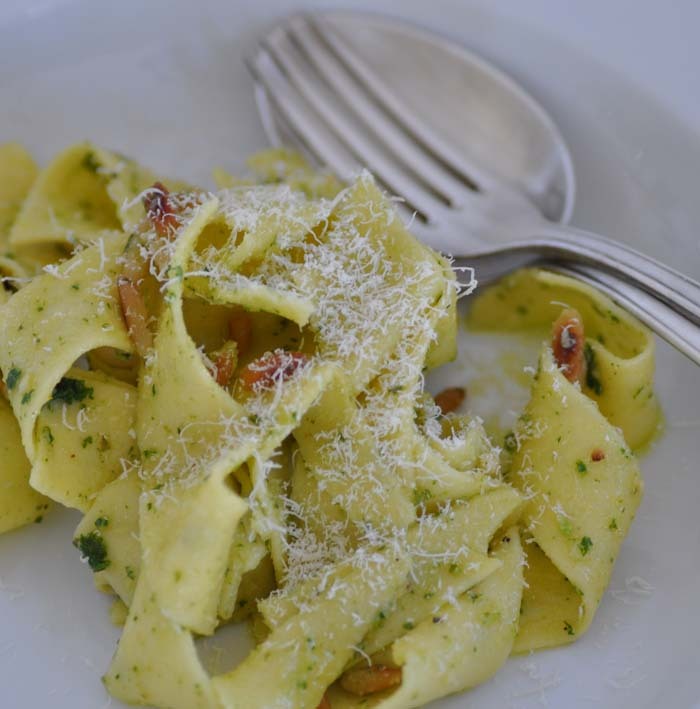 This entry was posted in recipes, winter and tagged kale, pasta, pesto by The Cook. Bookmark the permalink.